Decided I was going to have a long run on Sunday. London Marathon is creeping up and my miles run have been sadly lacking … well me. Running them. The weather was perfect, bright and cool. The trails weren’t too muddy (except for one small section which I had to long-jump over – I like to think of it this as cross training) and I had the whole afternoon to just run. Everything was going perfectly, until with the daylight fading I got to the 20 mile point. This is a long stretch on the canal, a bit muddy but a nice flat path. I was 2 miles from the end of my run and a MASSIVE dinner … until something glimmered whitely in the distance. A swan. The scourge of the canal-side runner. And not only one, but two swans, one of whom appeared to be sitting on a nest. The closest swan spotting me in the dusk, arched its wings menacingly in the standard ‘I-will-kill-you-and-all-your-family’ way that swans do. A swan. A bloody swan. I retreated. The swan smugly (it was practically smirking) sat down next to its mate on the nest and put its head under its wing. Aha! Maybe it’s gone to sleep! I took a tentative step forward. No movement from Duck-of-Death. A second step … out popped its head. Crap. I retreated again. What were my options? The canal was on my left, on my right was a very steep drop and a river. The drop was so choked with weeds and trees, I couldn’t creep around that way. I didn’t want to go back. It was a good few miles back and then I’d have to go onto major roads and take about a 6 mile detour to come back to this point and it would be full dark. I eyed the swans. The one on the nest was about 4 feet from the canal, the other one about 3 feet from it. There were ducks sitting almost opposite the pair which if I tried to run for it might act as an alarm and make the swans go mental and eat me. Argh! Decisions, decisions … and they all involved either death by swan, drowning in the (filthy) canal or running ultra distance in marathon training. Maybe if I tried the creeping up thing again? I surreptitiously moved up the canal path, but the guard swan kept LOOKING at me. In a threatening way. In a “You just try it, sunshine” kind of a way. In a “I EAT joggers for ALL my meals” way. I HATE being called a jogger. I kept my eyes averted and kept creeping. I was now about 8ft from Scary Swan. I kept very still and it tucked its head under its wing. 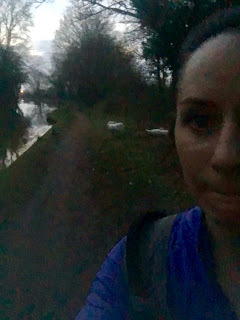 Legs spinning and arms pumping, I flew past the ducks who clattered into the air, squawking their displeasure, the swans’ head popped out like a beaky jack-in-the-box but I kept going – expecting to feel the bite of a large bill across my arse any second! But I just kept going ...! I turned back, still running to see it, large on the bank behind me but not catching me when I tripped over something grey and HISSSSSSSSSSSSSS!!! In my shock, I jumped about 6ft towards the canal and nearly falling in just kept my balance while the Canada Goose I’d tripped over and it’s mate hissed and did smug duck face at me. 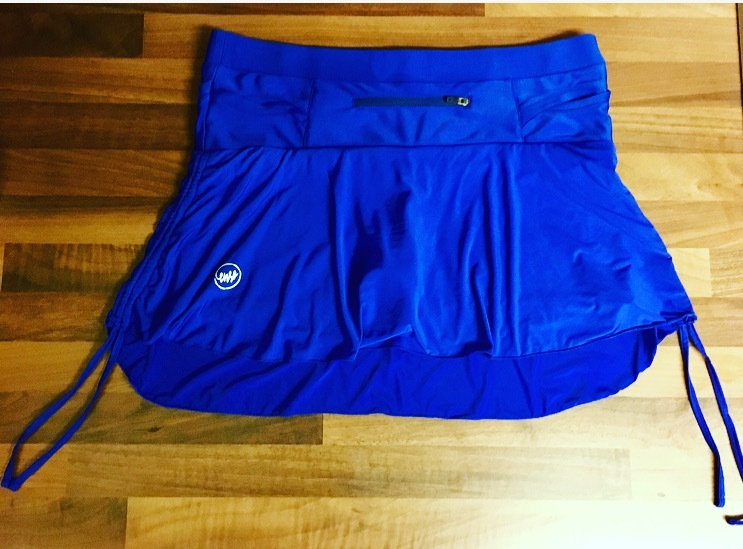 Enso offered me this skirt to trial and review. As usually I've said exactly what I thought and took no payment (not even in creme eggs). Running through the industrial estate, the sky was overcast, the buildings grey … but I felt like I could have been on a beach. Why? Because I was wearing a running skirt. 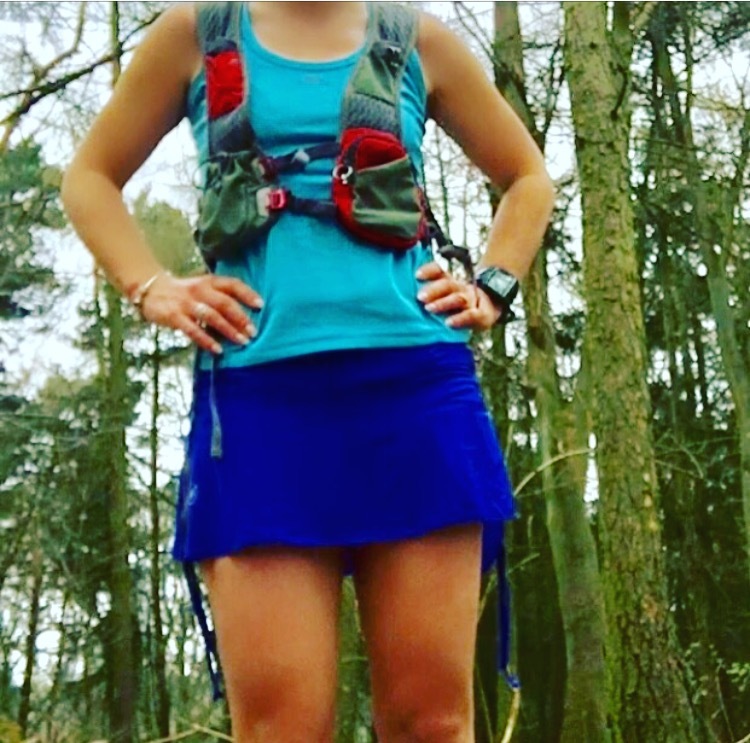 Just a little change to my usual run shorts, but it made me feel completely different. I felt feminine and pretty … even if I was probably covered in sweat and dust from the road, I felt like a lady. Enso sent me their running skirt to review. I tried it on several mixed terrain runs and here is my unbiased review. Mud on my legs from the trails! 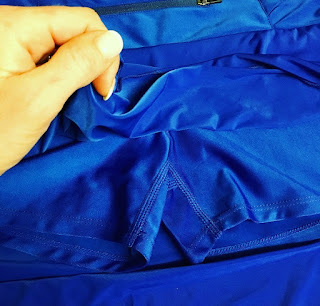 Compression shorts underneath the skirt – so no worries about chafing or accidentally flashing a passerby! It had a very flattering fit and clung in the right places and was looser in places I'd prefer it didn't cling! I liked the design. It was longer at the back and more importantly had plenty of pockets Including 2 with zips for secure items such as keys and 2 open pockets which could be used for gels or a small music player. I chose the blue skirt and it was a lovely bright colour, very summery! It made me feel like I was heading out to the beach rather than for a run! The shorts fit nicely around the waist and hips but there's a drawstring for additional security around the waist. It's quite short. I like this in a running skirt – I don't want to have lots of material clinging to my legs - but this could be less appealing to people who prefer to be more covered. There are cord ties to adjust the length of the skirt but of course this would make it shorter rather than longer! 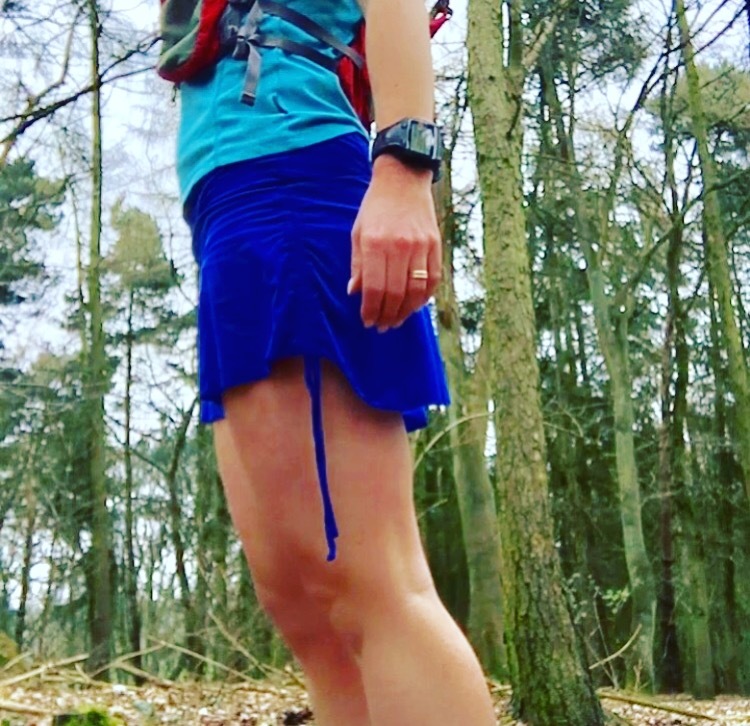 Sometimes when I'm running particularly at night or in quieter areas, I like to wear more asexual kit, rather than something pretty and feminine. While I know that in theory I should be able to wear whatever I like whenever I like, I'm also aware that as a woman, running on my own I don't want to make myself a target. This doesn't necessarily apply to the Enso skirt in particular but to any running skirt. A hill. Another stupid hill. I couldn’t even see the top of this one. My legs were aching from pedalling, my shoulders were sore and I was cold and wet from the wind and rain. I was down to my last half a flapjack. And then I did something I said I never would do. I unclipped my feet from the pedals. Climbed off my bike and started pushing it up the hill. It was a mistake. I knew that immediately. My calves started burning, my feet in their cycle shoes were sliding on the leaves and debris at the side of the road and worst of all was the sense of disappointment in myself. I followed the man in front of me who was also pushing his bike as other cyclists flowed around us. The blue jacket and wide shoulders obscured the view of the hill ahead and reinforced the feeling that the hill was a never ending spiral, fringed with high dirty verges. And that it was stretching higher and higher, making me work harder as a penance for being a coward and climbing off my bike. I was NOT having a good day. I was on the 3rd of 5 hills in the Rawlinson Bracket, a sportive set in Warwickshire, a county not known for its horrific hills or large climbs. I was cold, wet from a shower of rain, running out of water and snacks and tired from a bug which had been plaguing me for far too long. Most of all I was sick of cycling. However, I WASN’T sick of sitting. Nope. I was perfectly happy to carry on doing the sitting part. It was the having-to- work-to-get-the-bike-to-move part which was becoming tiresome. Also bike rides usually involved cake and I had seen NO CAKE. Just hills. Lots and lots of hills. Everyone else seemed to be in merry little groups. Granted some of these groups were at the side of the road fixing punctures or having arguments over whose job it had been to pack the snacks and “Why aren’t there any KitKats, Gerald? !” but at least they had someone to bicker WITH. I knew full well it was MY fault I hadn’t packed any cake. 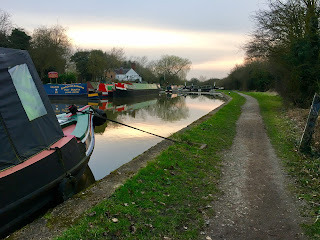 The route would probably have been very pretty if everything hadn’t been obscured by a layer of drizzle or if I’d been able to pedal forwards without feeling as though I was trying to go through treacle thanks to the headwind. While my logical brain told me it wasn’t possible to have a headwind the whole way around a looped course – my legs told it certainly was. And that the wind was doing it on purpose. And now I needed a wee. 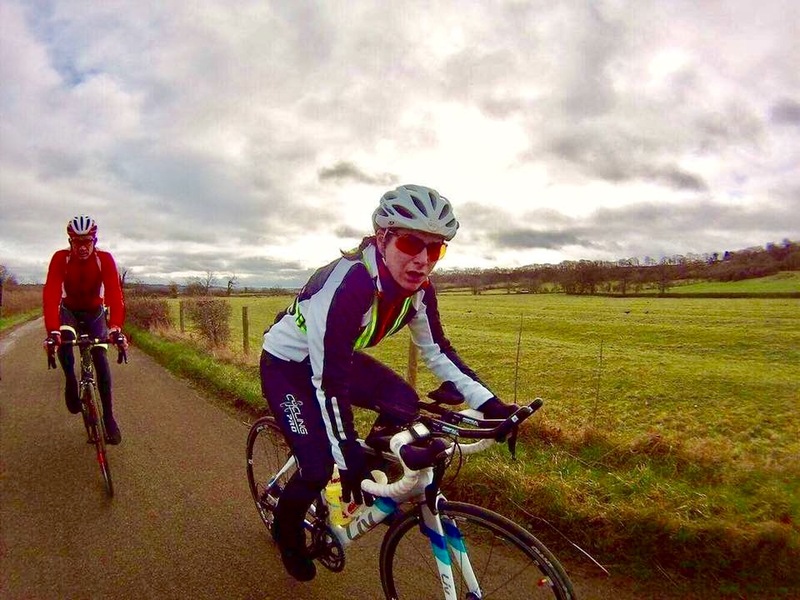 I had seen no other cyclists for ages, just hedgerows and the occasional village pub out of whose windows wafted the most amazing Sunday Roast Dinner smells. I could be in the pub instead of on a bike like a dripping-wet, lycra-clad Bisto twin. Just as I finished my last mouthful of water, I spotted a quill flag and about 100 other cyclists all piled into a damp looking carpark and pulled in. The feed station. Finally. I refilled my water bottle (with water as there was no sports drink left) and the only food that was left was green bananas which I was recommended by the volunteer NOT to try as you needed a knife and some special ninja skills to open them. Possessing neither of these things, I left the green bananas to the next samurai. At least there were toilets. 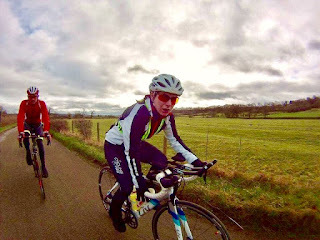 I went into one of the cubicles and started the lengthy that is involved when you need a wee while dressed in bike kit. It’s like unwrapping a multi-layered Pass-the-Parcel but in an enclosed space and while trying not to touch any surfaces. All my kit was damp – from rain not badly directed wee – and it was not a pleasant experience putting it back on again. I was like the grumpiest and dampest Egyptian Mummy ever. And not made any cheerier by the thought I had to keep wearing these wet clothes for another hour or so. I was cold, miserable and I’d had enough. I had no idea where I was but I was going to call for a lift home. And then I heard a familiar voice. A voice belonging to a friend. Linda my friend from running club was outside. 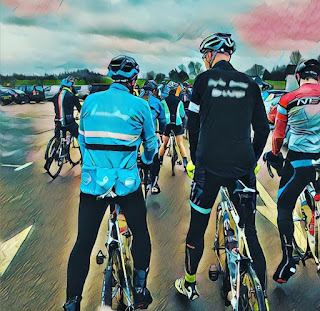 I was treated to a massive hug and she told me she was cycling with another friend of mine, Fiona and they invited me to cycle the rest of the sportive with them. I’m sure there’s something inspiration or clichéd I should say here. Something like “A bike ride with friends is even better than cheese (except for that blue soft cheese that smells of socks)” or “cycling with friends magics the rain away and means you get pushed up hills by fairies” or something but cycling with Fiona and Linda really made ALL the difference. We chatted the next 25 miles away and the distance flew past. We laughed when we got hailed on, we sped down the hills all together and had a grand old time. Even the hills seemed to shrink. There were 5 hills on the course, 2 of which I cycled with Linda and Fiona … and we were so busy chatting that we didn’t notice them until they were halfway done. It was a VERY different experience to the first half of the course. We got to the finish full of smiles and were promptly fed huge amounts of cake by the lovely volunteers. The perfect finish to a tough start. Thanks for the company, girls. You were AMAZING. Fiona, Linda and me ... full of cake! 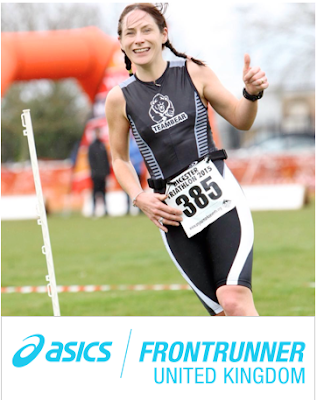 I am SO excited to tell you that I’ve been picked to be an ASICS FrontRunner! Running has been such a large part of my life for the last 7 years and I am SO EXCITED to be part of a community who loves it as much as I do! The ASICS FrontRunner team launch is at the end of March up in Manchester and I’ll keep you updated about what’s going on! Speak soon! If you want to find out more about the ASICS FrontRunner team you can take a peek at the website here. I'm a previously lardy girl who has swapped doner kebabs for trainers. It's just as pricey but better for my waistline. Plus I end up with a lot less garlic sauce down my front. My first running goal was to break 30 mins for a 5k. Cracked that. Decided I may as well carry on with this running lark and am now the proud owner of a Boston Qualifying time, a London GFA and a World's Toughest Mudder Qualifier. Oh and a REALLY silly Guinness World Record. I talk too much, love my motorbike and am addicted to Cadburys Crème Eggs. Having a tentative go at triathlon - who DOESN'T enjoy a sport you can drown, fall over AND fall off doing? 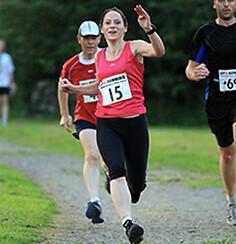 - and am throwing myself into ultra running. Voted 3rd best running blog 2014!